Prosenjit Hazra’s father, Biswajit Hazra migrated to Varanasi from East Pakistan (now Bangladesh) at the time of partition. Belonging to a poor Hindu family from East Bengal, he was still pursuing his graduation when partition happened. 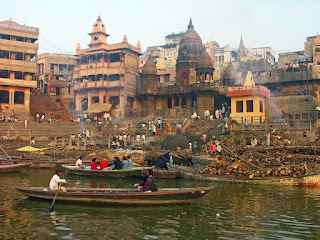 Varanasi was once called a ‘mini Kolkata’. Nearly three lakh Bengalis, who had settled here were engaged in various activities – trading, business and tourist services, among others. Biswajit knew a wealthy Banerjee family who had a large house  along the riverbank in Benaras and visited the place during vacations. When partition happened, Biswajit sought out the Banerjees who lived in Kolkata – the Banerjees could not invite him to Kolkata, but instead offered him to become the caretaker of the family’s ‘holiday mansion’ in Benaras. Living as a servant of the Banerjees, Prosenjit’s father completed his studies – as a caretaker, he had almost no income, the Banerjees though provided just enough to cover his food and other incidentals. After he completed his studies, they appointed another caretaker but allowed Biswajit to live in the outhouse until he could figure out his own life. Biswajit soon took an accounting job in a local office and in few years rented his own place. Biswajit married a local Bengali girl and in 1960, Prosenjit was born. Prosenjit’s childhood was ordinary; while his father managed to live by well financially, there wasn’t much luxury. They had their own house by the time Prosenjit was ready for college but then, tragedy struck. Prosenjit’s mother contracted cancer and all his father’s attention, income and emotion went into ensuring her wellbeing. Prosenjit, who had dreamt of appearing for IAS, too got caught up in the same charade and could not focus much on his studies. He, however, managed to pass his graduate and postgraduate courses in Eastern languages with distinction. His mother finally lost the battle with cancer by the time he completed his post-graduate studies. Prosenjit’s mother’s loss hit his father badly – the old man lost all touch with reality; his own mental health deteriorated creating another set of troubles for Prosenjit. Prosenjit got a job in one of the local colleges of the Benaras Hindu University as a professor of language but trying to take care of his ailing father and teaching – Prosenjit’s life was just sandwiched between work and home. His salary wasn’t great, but having a home of his own, his needs were few. The only pursuit which gave Prosenjit some gratification was the local theatre activity at his university. Prosenjit didn’t start as a theatre enthusiast but being a professor of languages, he slowly got exposed to literature and in turn theatre which arose from this literature. Many students who came to his class had dual interests in theatre and literature. ‘Coordinating’ theatre activities started as an administrative responsibility allotted to him by the college but as time passed, he started enjoying it and got more involved. Over time, he also started getting connected with the theatre circuit in other parts of the country – sometimes through his students, sometimes through delegations from other universities. Theatre thus gave his otherwise morose life a larger canvas which he could connect to people far and beyond. Through some of his students who went on to join institutions like National School of Drama in Delhi and Film and Television Institute of India in Pune, he started connecting with some leading theatre personalities. When the NSD organized Bharat Rang Mahotsav in Lucknow, he was sent by the University to attend. As the years passed and Prosenjit became more familiar with theatre, his language classes started becoming burdensome – he didn’t enjoy teaching languages as much as he enjoyed theatre. While he was a faculty of the Theatre Communications, he longed to move into mainstream theatre – in Mumbai or Delhi where the theatre was wider and more intense. But he had little choice – his father’s mental health left him with little options to move out of Varanasi. In 2010, when the Bharat Rang Mahotsav was held in Bhopal, he was invited by several of his connections to attend it, but he couldn’t go. His father’s condition had deteriorated further – he became hysterical, experiences from a long bygone era of partition, longing for his birthplace and even a sense of alienation started taking over him. Though he has spent almost his entire life in Varanasi, he still lacked the sense of belonging to this place. Finally, his mental health took over his physical well being as well - he started refusing to eat, he lost a complete sense of living – and finally died. During the interrogation with the Mumbai police, Prosenjit explained that after his father passed away, he had little else to do in Varanasi than continue his job. Bengalis in Varanasi were anyway on a decline - most of the big houses owned by Bengalis were either being sold or encroached – education too wasn’t as great as it used to be. And even though he was with the prestigious BHU, he had pivoted away from his main skills of language studies into theatre. And he had no other responsibilities and family to take care of, he decided he wanted to spend the next few years of his life working full time into the field which he had become passionate about – theatre. He had meagre savings, but they would suffice, and he had some former students who treated him with high esteem and affection, who had invited him to join the theatre community in Mumbai where they themselves were. And hence, after the death of his father, Prosenjit decided to migrate to Mumbai. The story was very convincing, ACP Vaman could not spot any fabrication, any lie, even any discontinuity in his version of events – the whole Maoist handler angle did not fit in anywhere in this story. During interrogation, Prosenjit sounded and acted natural and genuine – there was hardly any reason not to trust his version of events. When told about his email and messenger communications – Prosenjit was lost. He had an email account on Gmail, the password to which he volunteered to share but he claimed to have never heard of the encrypted mail service and he didn’t even know what a messenger was – Whatsapp was yet to gain popularity. Prosenjit Hazra had a frail, thin frame – he didn’t look very healthy, and this always made Vaman and his team go mild on him. They had not used force on him during the interrogations; in fact, he volunteered information he had, so willingly that they did not find any reason to use force until now. Vaman wondered if IB and Assam police had sent him on a wild goose chase; was Prosenjit Hazra indeed an innocent man only to have the wrong first name and circumstances which put him into a peculiar set of suspicion? 0 Comments to " The Curious case of Prosenjit Hazra - Part 2 "